O-food was a Scandinavian food bar and “fast casual” venture that opened in Spitalfields Market, February 2015. 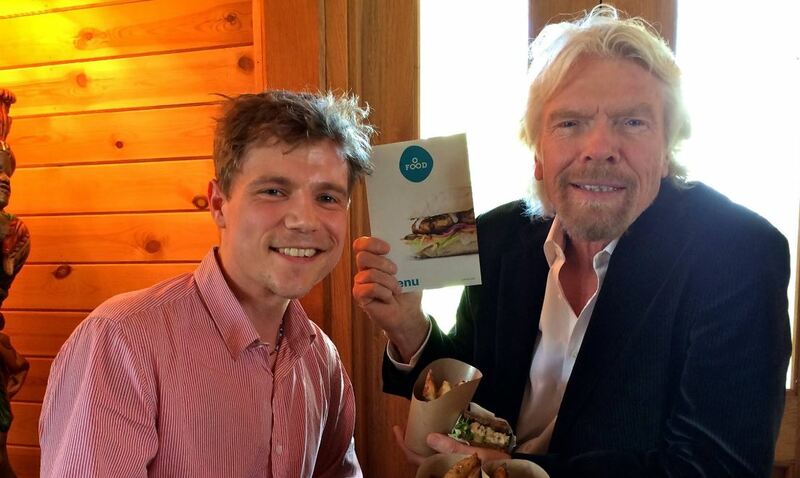 The business launched to much fanfare and even catered a lunch with Sir Richard Branson, (see pic below). Sadly just over eight months later, in October 2015 the shop had to close . Here founder Jens Hannibal talks about the reasons they decided to call it a day. O-food was a purpose-driven enterprise with a mission to change the world by changing the way we eat. The plan was to build 10-15 shops in London and then go international from there, combining scale with purpose to maximise positive impact. I’m going write about the three key mistakes that led to this outcome, and what lessons can be learnt from those mistakes. It’s a fact that there will be mistakes made in all entrepreneurial ventures, and I believe that the overarching lesson is that one should look at mistakes not with dismay, but rather with curiosity – and even appreciation for the invaluable learning experience. We were opening a restaurant operation in an expensive, high-profile location that cost £95,000 a year including service charge and business rates. We also had significant staff costs of approximately £180,000. Including other fixed costs such as utilities and insurance, we basically had to get about 200 people through the door everyday just to break even. This may sound like a lot, but when doing our sales forecast we had been counting the number of visitors in, for example, Pod (serving healthy fast casual lunches) on London Wall, and Chop’d in Spitalfields. Pod was doing around 800 transactions a day and Chop’d was doing around 600. These numbers gave us confidence that we should be able to get to 200 customers a day fairly easily. However, as we learned, it was taking a lot longer to build a loyal customer base than we anticipated. We had 100-150 transactions a day – well below break-even. And because we hadn’t been prudent enough in doing and reacting to the sensitivity analysis, cash was running out quickly. When we were planning the restaurant concept and doing the financials we didn’t yet have a location, because 99% of the time you will need the cash before a landlord will commit to anything. As such we had to make assumptions about the cost of items such as rent, fit-out costs, etc. The important thing is that start-up costs can vary a lot in the hospitality industry, and this has to be taken into account. With the above in mind, the key take-away when doing the budget, and ultimately raising capital, is that you need to be really honest and realistic with yourself and the investor(s) to avoid having to try and re-finance with your back against the wall, as was the case with O-food. We had set a budget of £300.000, which turned out to be about £150,000 too little. Think about the industry you are starting in. Do you have variable start-up costs (CAPEX); what’s your burn-rate; have you done a thorough sensitivity analysis; what is the optimal way to structure your funding programme? Having the right people onboard means everything. When we started O-food it was decided by the board that I should be the general manager. I had serious doubts about this idea, because I know how much experience and knowledge it takes to be a good general manager. I would not only have to learn how to do this, but also be doing it in a start-up context with systems that needed to be developed and implemented. We did hire an assistant manager who had all the enthusiasm in the world, but who was younger than me and with just a few years of experience in management. To cut a long story short, we got started and it was not going exactly as according to the theory. Eventually, the assistant manager and O-food parted ways, and we started to look for a proper GM. In the meantime, a highly experience former senior exec from McDonald’s got involved via O-food’s lead investor. With her skill and experience on board the whole game started to change and when the new GM finally started in July, we really thought we’d be able to turn it around and find some more funding. Nevertheless, it was too late. The business case had already deteriorated so much that potential investors just “couldn’t justify putting money into it”. The key take-away here is that in ANY industry you’ll need to surround yourself with people who have direct experience within that industry. My partner in O-food had a long and successful career in medical device industry as a top level director, but zero experience in the restaurant industry, and the other main board member also had no direct experience with restaurants. You need board members with direct experience – particularly in the very early stages. And, even more importantly, you need people with direct experience on the daily team in key management/training roles. In the end, I think the biggest mistake of all is to look at mistakes as just that: mistakes. I believe mistakes are blessings in disguise. It’s been almost a year since I closed O-food and I’m already well underway with the next venture, full of confidence and with a far better understanding of what I’m doing. It’s no longer theory. Certain aspects are no longer up for discussion, as I know what needs to be in place before we go ahead: the right people, a well-structured funding programme, and a strong vision and purpose that keeps you and everyone around you, including customers, inspired and motivated. Entrepreneurship is not about a destination: money, fame, or the like. It’s a tough, arduous, but also fun, thrilling and wondrous journey that begins with a single step. Find your purpose and make the most of your mistakes along the way.